Ideal for low to medium-intensity workouts, the water bike can be positioned in front of the Endless Pools swim current for a more challenging ride. Or use it in conjunction with our Underwater Treadmill to complete an entire triathlon in your home pool! Special Payment Plans For Any Budget Available From Financit here. 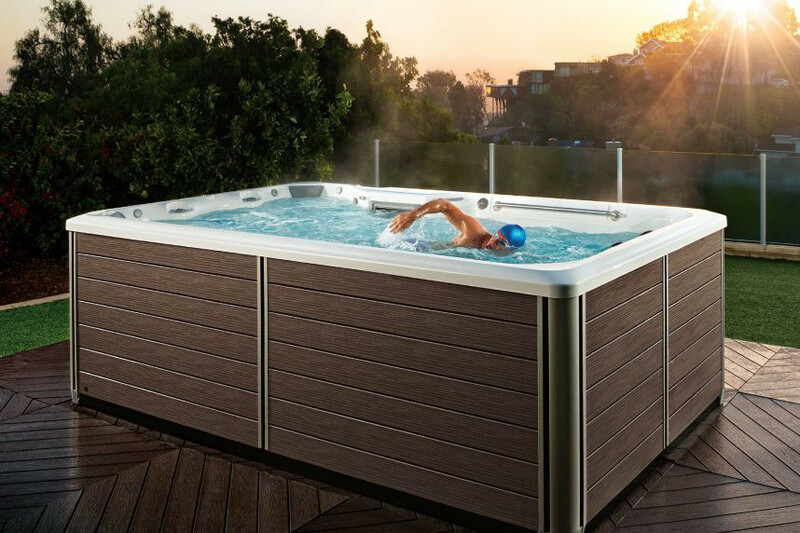 Introducing the all-new Endless Pools® Fitness Swim Systems. We are all about fitness, and we know that taking time for personal wellness isn’t always convenient. This is why © 2019 WatkinsWellness™ developed “The Endless Pools Fitness Systems”, a holistic complete system with your wellness in mind. There is no other name recognized in aquatic fitness like Endless Pools is. After all, Endless Pools are the folks that pioneered propeller-driven swim-in-place technology in 1988 remaining the industry-leader for over 30 years. The extraordinary swim current generator has helped over 20,000 swimmers of all skill levels experience the many benefits of aquatic fitness. Exceptional performance of the Endless Pools Swim Machine is why its appeal ranges from the casual swimmer to the most elite professional. It will please your whole family, with a variety or settings and options, find out more in store today! Swim at your own perfect pace whenever you like on your own schedule. No traveling, no crowded pools, no heavy chlorine. 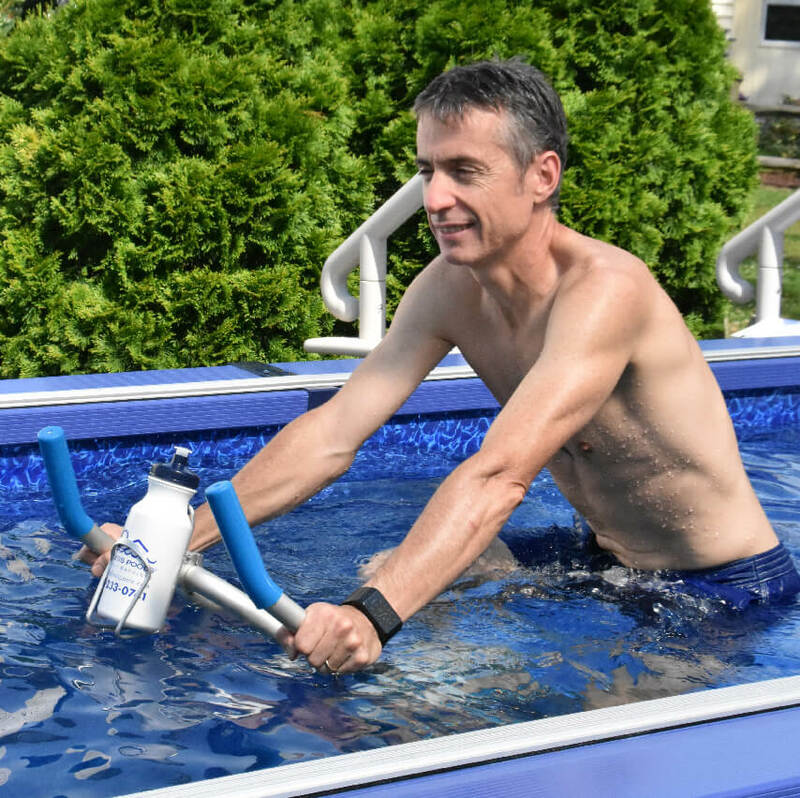 Just your own precision engineered healthy lifestyle machine and swimming pool, where you swim or exercise against a smooth current that’s fully adjustable to any speed or ability. Our swimming pools are simple to install, easy to maintain, economical to run, fit easily in new or existing spaces indoors or outside, and are so handsome they can become a showplace in your home. The small footprint means our swimming pools use fewer resources, and energy than traditional pools. gives you a workout that’s more effective than indoor cycling and gentler on your body. Take a spin on the water bike for calorie burning and heart health with minimal joint impact. By cycling in water, you’ll get increased core engagement plus 360° resistance to build strength and recover faster. 5 Adjustment Points (legs, seat & handlebars) for a perfect fit. Fast Drainage through underside perforations. Silicone Wheels for smooth re-positioning that protects your pool’s liner. Padded Pedals for barefoot comfort. Sturdy Frame and silicone stability feet for your security, even when standing. Lightweight Construction lets you move it in and out of the pool easily. The water bike has no speed settings to worry about; to increase resistance, simply pedal faster! The water bike puts you in complete control. Weighing just 21 pounds, the Aqua Bike’s 5-piece frame assembles in minutes. Endless Pools provide all the benefits of traditional swimming pools, in a fraction of the space. Get your backyard consultation and a brochure now! For a superior swim-in-place experience, customers need look no further than the iconic Endless Pools® Swim Machine. That’s because Endless Pools uses a custom-made, hydraulically powered propulsion system that creates a laminar current of up to 5,000 gallons per minute (GPM) that is wider than your body and deeper than your stroke. Multiple conditioning grills smooth and redirect the water, resulting in a swim current that is free of turbulence. Even at full power, it feels like swimming in open water. The swim machine is powered by a hydraulic power unit (HPU) that pumps high-grade, biodegradable vegetable oil to the incredibly efficient 5 HP underwater motor. This design allows for maximum power while remaining energy efficient. With the water resistant remote control, you can increase or decrease speed on the fly. The swim machine flow speed ranges from 5:00 to 1:08 minutes per 100 yards, and can be easily adjusted for precise pace selection.